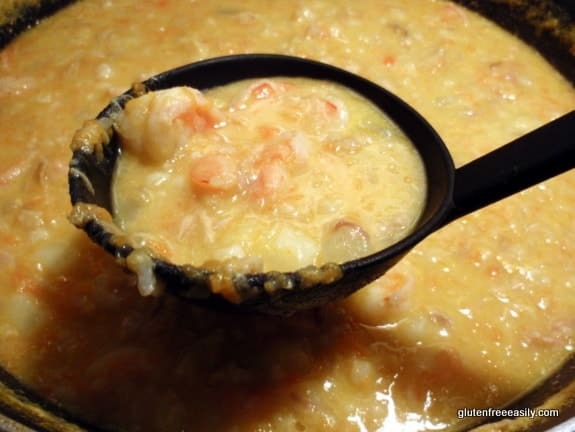 On the menu today is this pretty amazing gluten-free Seafood Chowder! As most of you know, my gfe approach for eating gluten free is to seek out naturally gluten-free foods and meals or ones where I can make a quick substitution or adaptation. When eating dairy free, my approach remains the same. Today’s dairy free and gluten-free Seafood Chowder recipe is a good example of both my gfe ways and my dairy free easily (dfe) approach. For either gfe or dfe, I’m not interested in stocking up on lots of specialty products. I like to rely on what’s in my pantry all the time, which I consider to be my actual pantry, refrigerator, and freezer. I always have coconut milk or almond milk on hand to use as my dairy-free milk and, usually, oil (olive or grapeseed) to meet the fat/shortening requirement. Plus, I do typically use organic butter, but non-dairy butter (and often oils) also works just fine. So when Linda’s theme of Seasonal Soups was announced for this month’s Go Ahead Honey It’s Gluten Free Carnival, my thoughts went to chowder with those dfe ingredients in mind. Specifically, I thought of Chicken Corn Chowder and this Tuna Chowder recipe. I like chowders a lot. I think they’re perfect cold weather fare. I’ve already shared my Quick and Easy New England Clam Chowder, which is both gluten free and dairy free, here. That recipe was based on another favorite in the gfe household—Baked Potato Soup. And while we love Chicken Corn Chowder, that recipe is shared fairly often online. However, I’ve never seen Tuna Chowder shared, so I decided to share that seasonal soup—with a Seafood Chowder variation. I found the original version of this Tuna Chowder recipe in The Tightwad Gazette newsletter of May 1994. Yes, long ago. (FYI—The original recipe is also included in the overall compilation, The Complete Tightwad Gazette, of Amy Dacyczyn’s great, but long-ceased newsletters.) I shared it with my good friend, Lisa, and she made it before I had a chance to try it. The original called for a cup of cheese, but Lisa tasted it before and after adding the cheese and said that the cheese didn’t really much flavor or color appeal to the chowder (the carrots alone add a lovely golden orange hue). Now how often does that happen that cheese is not needed? Not often per my experience, but score one for the dairy-free set! Lisa also added potatoes, which just makes sense for any chowder recipe, plus, potatoes can often add extra thickness and creaminess to dishes—another plus for those who are dairy free. I use your basic garden-variety Russet potatoes in this chowder (which are actually full of antioxidants as it turns out) but I bet this recipe would be lovely when made with Yukon Gold potatoes. The original recipe made more of a soup and, again, I wanted a chowder so I reduced the milk amount. We eat tuna, but not every day and sometimes not even once a week because of mercury concerns. However, if you don’t eat tuna at all, you can substitute canned or fresh salmon (or another fish of your choice). The rest of the ingredients in this soup are also ones I always have on hand and, hopefully, you do, too. And you can leave it as tuna chowder or you can turn this recipe into Seafood Chowder. While I enjoy it as tuna chowder, Mr. GFE thinks the tuna flavor alone is too strong and he’s a tuna fan, so please keep that in mind if you are not. To make him happy, I often add in up to a pound of shrimp and two strips of bacon. Oh, the sacrifices a dutiful wife must make! Mr. GFE’s assessment of my latest gluten-free Seafood Chowder … “absolutely delicious … put this on the menu and that’s all they’ll order. How can you beat seafood soup?” Indeed. Sautee potatoes in butter in large saucepan or extra deep skillet for about 5 minutes. Add carrots and onion. Continue sautéing until onions are translucent (about 5 minutes more). Add chicken broth and then gradually add in milk. Heat over medium heat until mixture is thick and bubbling. If adding uncooked shrimp, add now and cook for about 5 minutes. Add tuna, Worcestershire sauce, salt, and any other seasonings. Add in flour (or other thickener). Cook over medium low heat until potatoes are adequately softened and chowder is thick and tastes like, well, chowder. Add bacon and if adding cooked shrimp, add now and continue cooking over medium low heat just until heated through. Serve and enjoy. Makes about 4 servings. I used tuna packed in olive oil, so I drained the olive oil from the can into the skillet and added 2 tablespoons of butter before sautéing carrots and onions. One can use other thickeners like arrowroot, cornstarch, tapioca, potato flakes, or just “cook down” longer over low heat until sauce is reduced/chowder is thickened. Finally, like any other soup I make, I’m always game to add in little bits of “this and that” from the refrigerator. This time it was one cup of brown rice. Potatoes and rice together might seem like too much, but the combination worked just fine and the instant thickness put this chowder on the table faster than usual. If you are looking for a “bread” option to go with this gluten-free Seafood Chowder, there are several fantastic ones here at gfe. Some of the options that contain dairy have been made successfully by readers using alternatives like Daiya Cheese; so please be sure to read comments if you don’t see a dairy-free option in the post itself. My favorites are: Popovers, Marvelous Cheese Muffins, Garlic Cheese Biscuits, Flat and Firm Cornbread, Honey-Sweetened Corn Muffins, Pumpkin Corn Muffins, Kiva’s Golden Flax Bread, and Paleo Bread. If none of those appeal to you, be sure to check out my Bountiful Bread Basket series (kickoff post with all the links here) for many more bread options. Originally published March 26, 2011; updated December 8, 2018. This looks really good! I am thinking of using coconut milk… shrimp… and some chili flakes. Without the tuna. I am definitely making this for dinner tonight! I have found that if you use a russet potato, they thicken better than others because they tend to break down more. Hi Jacqui–It looks like you’re new here–welcome to gfe! 🙂 Oh, I think you’ve come up with a winning combination of ingredients there. I like the addition of the chili flakes in combination with the coconut milk. I used almond milk for my latest version and have used a combination of coconut milk and almond milk before. (While I love coconut milk, hubby does not always like it in soups if it’s the only milk used.) Great point on the russet potato … you’re so right about russets breaking down more. How do I make this in slow cooker? Joy–I’ve never made this in the slow cooker and I’m not sure how that would work, given the fact that this chowder is thickened in the skillet on the stove top. I also think that if you did figure out how to make it in the slow cooker, you’d have to be very careful not to “overcook” it. This is sort of a delicate chowder. If you make it on the stove top, I think you’ll see what I mean and then can decide if you think it would work made in the slow cooker somehow. Hey Jacqui–Just FYI, I realized that I had the measurement amount wrong for the carrots. Two carrots equals about a cup not 2 cups. 🙁 Yikes, that would be a really orange soup. 😉 Wanted you to know before you made it! that looks heavenly, especially for a chilly day like today! I was all set to leave soup behind and lighten up for warm spring weather. The temps are not cooperating and my thoughts are turning back to soup. Your recipe is just in time and I love chowder. I think I would definitely like this with the shrimp added to it. It looks delicious and great for these cold days of early spring. We only got a dusting of snow here, but any snow in March is surprising. Thanks for participating in this month’s Go Ahead Honey event. Thanks, Linda! 🙂 I was glad your theme worked out with what I really wanted to eat. 😉 Spring can bring such temperamental weather, but eventually the cold weather won’t be able to hang on. Nancy–LOL I’m sure your hubby’s chili was terrific as well. 🙂 You’re right on this chowder … it’s not too rich, which some chowders can be, and it’s just filling enough. One soup mug is the perfect amount. 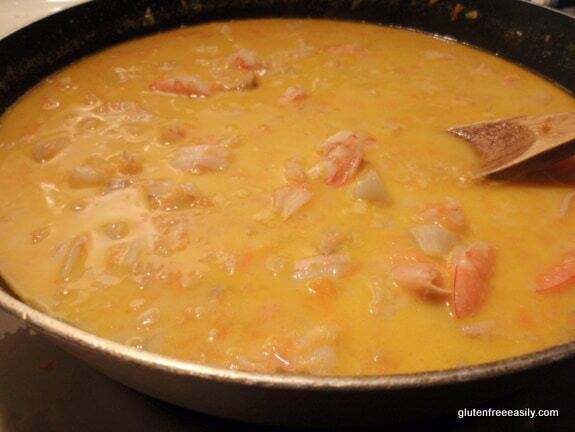 Sure on the mention … wish I’d had some of your sweet potato biscuits to go with this chowder. I should have started looking earlier! Oh, Shirley, I love chowder! This recipe sounds so good and our temps are still freezing here! This will be the perfect thing for a hot lunch during the week! This recipe was easy to follow and turned out very yummy! This looks SO good Shirley! Hey Shirley! When I saw this recipe yesterday, I had to make it. I avoid night shades, so instead of the potatoes, I used 2 cans of white beans, drained and mashed. I wasn’t sure if the white beans would work, but I processed them in the food processor and DH had no idea that there were beans in there. They worked very well to create a thick, hearty chowder. I also used unsweetened almond milk, and everything else exactly as your recipe states. The chowder was absolutely delicious! We just had a bowl of left over chowder for lunch and it’s a great day for it. We had snow here this morning. Thank you for sharing your wonderful recipes !! Yeah for dfe!!! I love this chowder Shirley – absolutely fabulous. I made a chowder recently, very different from this one, but your same awesome easily approach. Can’t get enough of these hearty soups! Oh wow! I just made this for lunch.. YUM!! Hit the spot! And it came together so quickly! I already have bags of shredded carrots in the freezer in 1 cup baggies.. so that cut the prep down even more. I live in an area that carrots are king.. they even have a carrot festival every year.. so I get a HUGE bag in the fall for pennies, and grate them up in the food processor, divide them into baggies and freeze. The only difference: I used coconut milk, a couple pieces of back bacon that I sauteed with the veggies, pre cooked shrimp and no tuna.. a touch of red pepper flakes, and a bit of chopped baby spinach right at the end. Oh.. and no Worcestershire sauce, as in Canada it isn’t gluten free. 🙁 I also didn’t use any flour, as it was perfectly thick without. Hi Jacqui–This is such great news–thank you so much for sharing! Hey living in the carrot capital must be cool! A carrot festival would be fun, too … is there a carrot festival queen? I’m just wondering if that’s a possible role for your daughter in the future since carrots are her favorite veggie. 😉 I love the idea of preparing and freezing carrots like that. For this soup alone, it’s worth it, but must come in handy lots of other times, too. Would be a cost saver, timesaver, and wastesaver for most of us. 🙂 It doesn’t happen often, but I always feel so badly when I forget and a carrot or two goes bad on me. 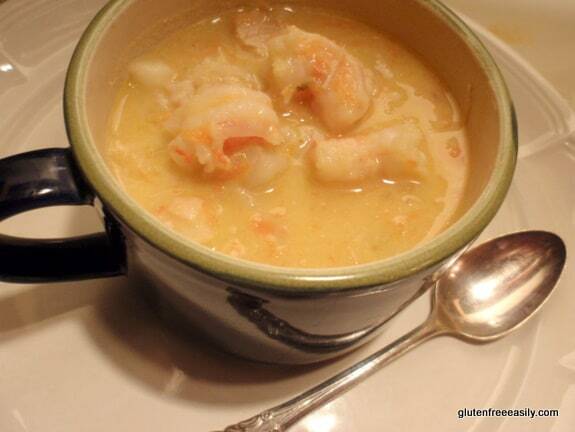 What a festive & well flavoured gf & df seafood chowder soup! Looks so tempting & truly festive too! I just gave you an AWARD!! Yes!! Why?? You can read it @ my latest post! Come over & check it out why!!! 🙂 Happy Times! Kay–I can’t think of a better combination! Enjoy, my friend. 🙂 Thanks so much for always taking the time to comment; it’s much appreciated! This is great for all the chowder loving folks in my family. They would be very pleased if I made this for them. Thank you for sharing it on RFW. How is it that I had never heard of The Tightwad Gazette? I think I’m in love, and I think you’re the one who showed me the way to true love! Wonderful chowder. Looks delicious. Hi Nicole–Welcome to gfe! 🙂 LOL, but The Tightwad Gazette is a treasure. I have all the books (I, II, & The Complete Tightwad Gazette) plus all the original newsletters. The latter are my favorite, as I have notes written throughout them on what I really liked, adjustments to recipes, etc. Thanks re: the chowder! The carrots are key for the beautiful color. I will be ordering a copy of The Tightwad Gazette. 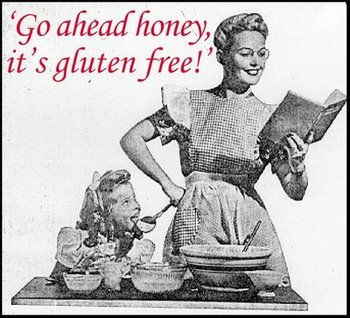 I’m embarrassed to have written a book about being a gluten-free tightwad without knowing about the Gazette! I would be honored if you were to review my book! I’d offer to get you a review copy if I didn’t think it would put all of this pressure on you! (is that a good enough hint?). Oh, I figure that TTG is not about GF, but it’s about being a tightwad. That’s enough for me! I don’t want you to feel pressured to review the book! I didn’t know you had already been sent a copy. Do what makes you feel comfortable! Oh my goodness! It is only something like 7:30 in the morning and still this chowder sounds AMAZING! I agree with you about a well stocked pantry making it easier to get food on the table. Hi Carol!–Thanks, dear. 🙂 This chowder is pretty darned good … give it a try. 😉 I love going to my pantry and “inventing” dinner or having all the ingredients for a recipe.! Shirley, I am off to make this soup, right now. I have to remove what is not kosher but this is so tempting, it should not be hard, to make it work. Thanks for such a goody. I completely forgot to send in my soup. Hi Chaya–I’m replying to both your comments at once. First, I’m so glad you were able to adapt my soup to be kosher and enjoyed it! Second, congrats on the new blog! Many thanks for sharing your adaptation as your first recipe! 🙂 I’ll definitely change my blogroll to have the new link so folks can find you. 😉 Thanks again, Chaya! Shirley, I made your soup tonight and it was delicious. I am planning on closing down Chaya’s Comfy Cook and I have opened a new blog, Comfy Cook. I opened it with this recipe. RIght now, it is the only recipe. Please take a look and also change my address on your list of blogs. Thanks. Let me know what you think. Thanks for that soup. This is the recipe. Forgot to give you the URL. Hi Shirley, I don’t have another package in the house to check the brand but when I go to the store, most likely tomorrow, I will get it for you. Hey Chaya–Not a problem, dear. Just curious so I can share any info with my readers and support group. Thanks so much for pursuing this info for all of us, Chaya! Hey Shirley! Thanks for linking this awesome recipe at this week’s sugar free sunday. What brand do you use for gluten-free Worcestershire sauce? I haven’t searched hard *sheepish grin* .. but I didn’t see any last time I checked. Are you actually using something that is marked gluten-free? Raj–I love participating in your new Sugar Free Sunday roundup! Lea & Perrins Worcestershire Sauce is gluten free per company website. Unfortunately it contains HFCS. Hence, my comment on excluding it for a refined sugar-free recipe. I hate that it contains HFCS, but don’t use it often, so I can live with that. French’s Worcestershire Sauce is also gluten free per numerous gluten-free listings like this one. French’s contains corn syrup vs HFCS, but also contains soy. I will update post with some of these notes. Thanks Shirley. Maybe I’ll get adventurous and try making some from scratch! Raj–That would be awesome! Then we could all benefit from your recipe. 🙂 That would be especially helpful to those in Canada as I understand all of their brands of Worcestershire sauce contain gluten. 🙁 Keep us posted! Okay.. the universe is telling me to make this soup. Heidi @ Adventures of a glutenfreemom just posted a GF AND refined sugar free recipe for Worcestershire sauce. sounds like such a lovely recipe – and budget-friendly too! I’ve never made chowder. Thinking I should! Your recipes give me hope. However my Mr gfe is also beef, pork, onion and sugar free too. I use agave syrup and leek in small amounts. I make a muffin which is gluten dairy and sugar free with oil, agave, gf flour and almond meal with lots of frozen raspberries. Mr gf loves them. I wouldn’t bother except when they are still warm. Cath–Welcome to gfe! 🙂 I’m so glad that my gfe blog is encouraging to you! There are ways to deal with all food restrictions, and still in a delicious way. 😉 I’m glad you’ve created a muffin recipe that your Mr. GF loves. Hope you find more recipes here that you both will love or that will inspire you to create some that you both love. I believe that ideally recipes–even made without certain things–should be delicious enough to work for the whole family. Pinned! Not only is this a deliciously comforting recipe, you’ve shared some fabulous tips for adapting recipes to make them dairy free, Shirley. Thank you so much for sharing with us at Hearth and Soul. Thanks, April! This is one of our very favorite recipes. Simple enough, but yet an elegant chowder and so comforting as you say.